This Outback Power package includes the Radian 4000 Watt inverter with 2 charge controllers and 8-200 RE batteries and IBR2 battery rack. Just add battery to inverter cables to complete the system. This package drop ships from the vendor. This package will provide up to 4000 Watt peak output with 12 kWh of usable AC storage for backup systems. Everything needed, outside of power sources and battery backup, is completely integrated—just install the mounting bracket, hang the system on a wall, make the necessary connections and the system is fully operational. 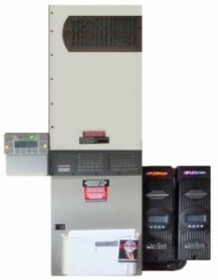 The Radian A Series 4kW inverter/charger incorporate OutBack’s GridZero technology, a superior level of intelligence in energy management for self-generation and self-consumption programs. It provides precise balancing between using stored energy, solar and utility power, blending-in the latter to overcome surges and load spikes. The inverter features an Advanced Battery Charging (ABC) profile option to support leading-edge battery technologies such as Lithium-Ion and others, and enhanced diagnostics for improved performance. Pre-wired on backplate, ready for installation.